Dean Charles Davis speaks at a memorial tribute to Don Carter on Oct. 12, 2017. This story was originally published on the Grady College of Journalism and Mass Communications’ website on October 19, 2017. Grady College faculty, alumni and friends celebrated a memorial tribute to alumnus Don Carter (ABJ ’38) and commemorated the Don E. Carter and Carolyn McKenzie Carter Endowment for Journalism Excellence Oct. 12, 2017, in the Peyton Anderson Forum. “Today we are privileged to remember Don and gather with people who will testify to his hope for journalism and for the students who will follow him at Grady College,” said Dean Charles Davis. Kent Middleton, professor emeritus of journalism and friend of the Carters, spoke about Don’s hopes for journalism’s enduring values. 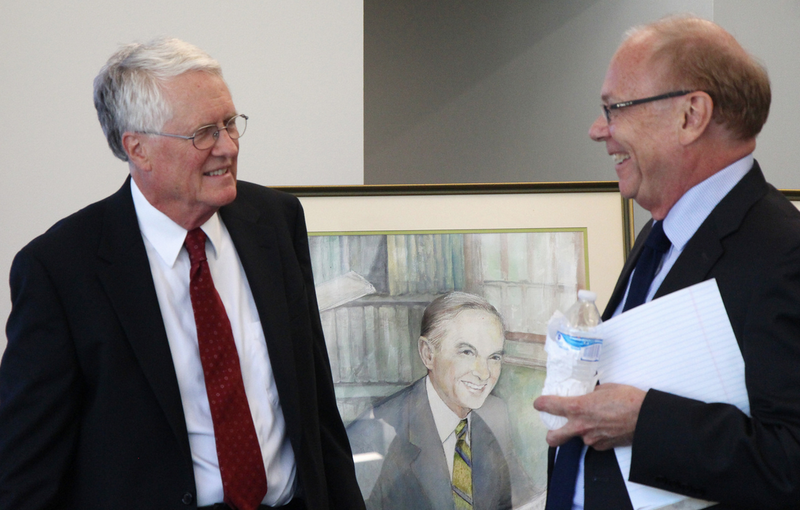 Kent Middleton and Terry Readdick reminisce about their friend, Don Carter. Janice Hume, head of the Department of Journalism and Carolyn McKenzie Carter and Don E. Carter Chair for Journalism Excellence, discussed the vision and plans for the Endowment for Journalism Excellence. “Our mission is to use this transformative gift to pass those values along to our students and to strengthen our industries,” Hume said. Janice Hume shares the vision and plans for the Carter Endowment for Journalism Excellence. The Carter gifts have been used to establish a course in journalism credibility, fund faculty research, support an intern at The Brunswick News—Don Carter’s hometown newspaper, launch a “Best Summer Stories” student contest, fund student travel for training and networking, and help to send students to cover the Paralympic Games in Rio, with much more to come, she said. Terry Readdick, another longtime friend of the Carters, shared some of his fondest memories that illustrated the couple’s shared sense of humor and zest for life. Among those in attendance at the memorial tribute were members of the Grady Board of Trust. Member Jim Zachary devoted a column in the Oct. 15 issue of The Valdosta Daily times to Carter, which he titled “Walking in the shadow of journalism greatness.” The piece is published here with permission. Don Carter was a truth teller. He died at the age of 99 and was still telling the truth right up until his death. In fact, Carter was a journalist’s journalist. At the Grady Board of Trust meeting held on the campus of the Grady College of Journalism and Mass Communication at the University of Georgia Thursday, we listened to stories about Carter and his love of Grady and for journalism. A Grady grad, Carter found himself at The Atlanta Journal in the early 1940s and that is how he found the other love of his life, Carolyn McKenzie, who competed with him for coverage while she was reporting for the Atlanta Constitution. Their rivalry was more than friendly, it became a lifelong love story, and they were married for more than 60 years. Don was always — and first and foremost — a reporter. By the end of his illustrious newspaper career, he was vice president of news for Knight-Ridder. 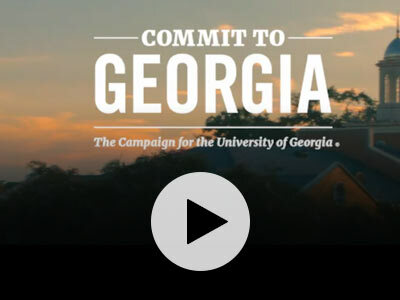 For many years, he sat on the board of directors of The Red & Black newspaper that serves the University of Georgia campus. As chairman of the board that Carter shaped for so many years, it is impossible not to feel the weight of his shadow and to be humbled by it. Don Carter is newspaper royalty. When he spoke, people listened. Carter believed in the importance of factual and unbiased reporting. He thought it was absolutely essential that hard news reporting and editorials be clearly separated. He died at his beloved home on Sea Island and left behind an incredible legacy and large endowment for Grady College and the educating of future journalists. Newspapers have a rich tradition as the Fourth Estate, providing a check on government while serving as a public watchdog. That important role in democracy depends on journalistic integrity. Journalistic integrity depends on accuracy in reporting, naming sources, correcting mistakes and clearly distinguishing between news and editorials. Don Carter believed news reporting was about telling readers who, what, when, where, why and sometimes how and not about telling readers what to think. Opinions are for opinion pages. News pages are for news — for truth telling — the thing that Don Carter did best. 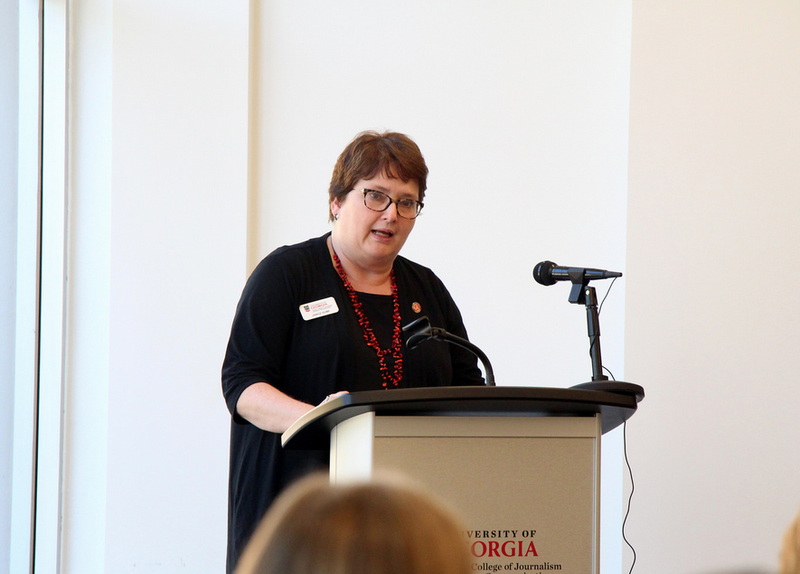 See more photos from the tribute on the UGA Grady Flickr account.